Three generations of the Hatt Family were active in photography. Four of the children of Francis Hatt and Alice Aspland Cross - William, Robert, Emma and Frederick Hatt - worked as professional photographers in Victorian times. Robert Aspland Hatt (1876-1907) and Lindon Hatt (born 1876), the children of Robert Hatt and Frederick Hatt worked as photographers at the start of the 20th century. Valerie Hatt and Barbara Bourn made their mark as photographers in more recent times. Francis Hatt (born 1796) married Alice Aspland Cross (c1801-1878) at the Church of St Martin-in-the-Fields, Westminster on 10th December 1820*. Francis and Alice Hatt went on to produce at least 15 children - Alice (born 1822),Sarah (born 25th June 1824), Ann (born 1826), Ellen (born 6th October 1827), Catherine (born 9th January 1829), Francis (born 4th October 1830), Eliza (born 6th July 1832), Emmile or Emily (born c1833), Charles (born 22nd January 1834), William (born 1835), Hervey or Henry (born c1838), Louisa (born February 1839), Emma Jane (born 1840), Robert (born 1842) and Frederick Lindon Hatt (born 1844). 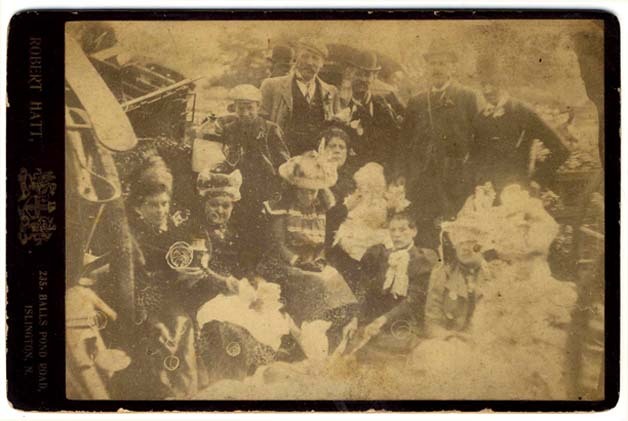 At least four of these children - William Hatt (1836-1869), Robert Hatt (1842-1918), Emma Jane Hatt (1840-1873) and Frederick Lindon Hatt (1844-1919) went on to pursue a career in photography. * Another entry on the International Genealogical Index on LDS Family Search records the marriage of Francis Hatt and Alice Aspland Cross as taking place at the Church of St Martin-in-the-Fields, Westminster on 15th January 1821. William Hatt was born on 25th July 1835, the eldest surviving son of Francis Hatt (born 1796) and Alice Aspland Cross (c1801-1878). On 11th December 1858, at the Old Church, St. Pancras, William Hatt married Louisa Willis (born c1839, Buckinghamshire). For the next few years, William Hatt, accompanied by his wife, travelled around the suburbs of London, carrying on "the business of 'photographer' ". William Hatt's first marriage was not a happy one. At a later divorce hearing, it was reported that William and Louisa Hatt "did not live together happily, they frequently had violent quarrels, and sometimes fought". In December, 1863, Louisa Hatt sold off William's furniture and left him for a man named Johnson, whom she had met "a short time before". Louisa Hatt then set up home with her new lover. In December 1864, William Hatt married for a second time. William and his new wife settled in Lewisham. 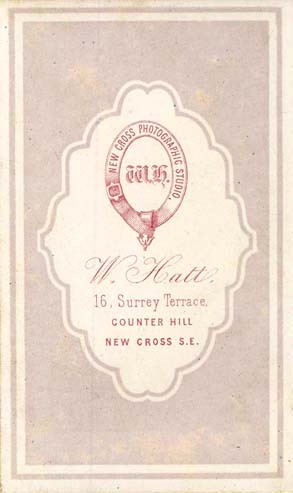 Around the time of his second marriage, William Hatt established the New Cross Photographic Studio at 16 Surrey Terrace, Upper Lewisham Road, New Cross, Deptford. In January 1865, William Hatt filed a petition for the dissolution of his marriage to his first wife Louisa Willis on the grounds of his wife's adultery with Mr Johnson. Neither Louisa or her lover Mr Johnson appeared in court and on the 15th June 1865 the petition was heard and a decree nisi was pronounced. However, the authorities were later informed of William Hatt's second marriage which had taken place in December 1864, some six months before the decree nisi was granted. 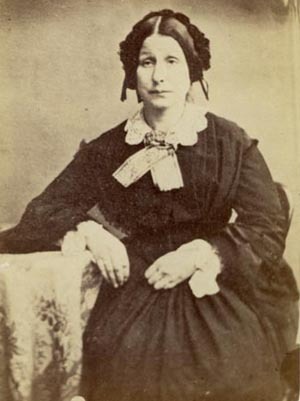 Emma Jane Hatt, William's younger sister was called to give evidence and she testified that she had been present at both her brother's weddings, the first of which took place in December 1858, and the second in December 1864. It was clear to the Queen's Proctor that William Hatt had "contracted a bigamous marriage" and, on 2nd February 1866, at the Court for Divorce and Matrimonial Causes, the original decree nisi was rescinded and William Hatt's petition for divorce against his former wife Louisa was dismissed. 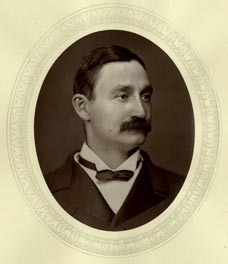 William Hatt's financial affairs proved to be as unsettled as his personal life. William Hatt was in business as a photographer for less than three years from December 1864 until October 1867. The London Gazette reported that William Hatt, photographer of New Cross, Deptford, was declared bankrupt on 18th October 1867. An application for the discharge of the bankruptcy was submitted on 13th December 1867 and the photographic studio at 15 Surrey Terrace, Deptford passed to Robert Hatt, William's younger brother. William Hatt died in Deptford early in 1869 at the age of 32. (William Hatt's death was registered in the South London district of Greenwich during the First Quarter of 1869]. 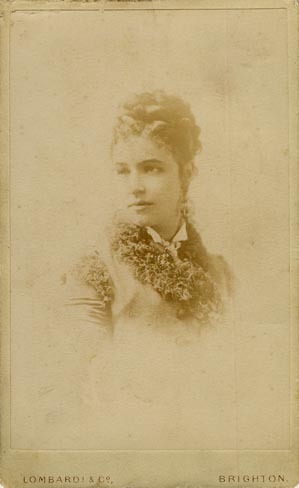 [ABOVE ] A portrait of a woman produced at the studio of William Hatt. The original portrait dates from around 1860, when William Hatt had just embarked on a photographic career. 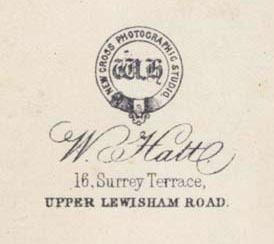 [ABOVE ] The trade plate of William Hatt, Photographer of 16 Surrey Terrace, Upper Lewisham Road, New Cross, Deptford, as printed on the reverse of carte-de-visite portrait (c1866). 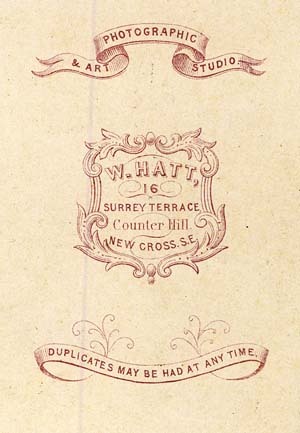 [ABOVE ] The trade plate of William Hatt, Photographer of 16 Surrey Terrace, Upper Lewisham Road, New Cross, Deptford, as printed on the reverse of carte-de-visite portrait (c1866). [ABOVE ] A carte-de-visite portrait of a man seated at a writing table, photographed at the studio of William Hatt, 16 Surrey Terrace, Upper Lewisham Road, New Cross, Deptford (c1866). After William Hatt was declared bankrupt in 1867, the photographic studio at 16 Surrey Terrace passed to Robert Hatt (1842-1918), William's younger brother. See the panel on the photographer Robert Hatt below. Robert Hatt was born in Islington on 12th May 1842, one of six sons born to Francis Hatt (born 1796) and Alice Aspland Cross (c1801-1878). Like his siblings, Robert Hatt chose to pursue a career in photography. The 1861 census, records Robert Hatt as a "Photographer" at 6 Ranelagh Road, Paddington, London. 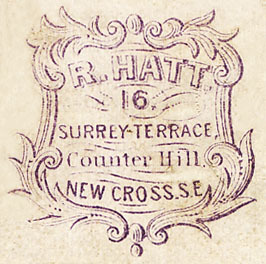 Towards the end of 1867, at the age of 24, Robert Hatt took charge of his older brother's studio at 16 Surrey Terrace, Counter Hill, New Cross, Deptford. Robert Hatt's older brother, William Hatt, had been declared bankrupt on 18th October 1867. Robert Hatt remained in charge of the photographic studio at 16 Surrey Terrace until 1874, when he left New Cross in S. E. London for the Sussex seaside resort of Brighton. [ABOVE] The trade plate of photographer William Hatt, 16 Surrey Terrace, Counter Hill, New Cross, S.E. London, as printed on the reverse of carte-de-visite portrait produced in 1867. [ABOVE] The trade plate of Robert Hatt, Photographer of 16 Surrey Terrace, New Cross, S.E. London, as printed on the reverse of carte-de-visite portrait (c1872). 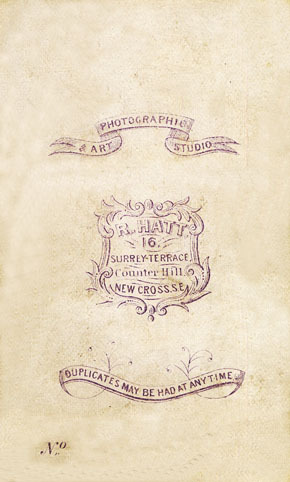 Robert Hatt took over his brother's photographic studio in 1867. [ABOVE] A carte-de-visite portrait of an unknown woman, photographed at Robert Hatt's photographic studio at 16 Surrey Terrace, Counter Hill, New Cross, S.E. London (c1872). [ABOVE] A vignette portrait of an unknown young woman, photographed at Robert Hatt's photographic studio at 16 Surrey Terrace, Counter Hill, New Cross, S.E. London (c1870). [ABOVE] A carte-de-visite portrait of an unknown woman, photographed at Robert Hatt's photographic studio at 16 Surrey Terrace, Counter Hill, New Cross, S.E. London (c1872). [ABOVE] The trade plate of Robert Hatt, Photographer of 16 Surrey Terrace, New Cross, S.E. London, as printed on the reverse of carte-de-visite portrait (c1870). Around 1874, Robert Hatt entered into into a business partnership with a young Brighton photographer named Burt Sharp (born 1851, Brighton) and Eugenio Martinucci (1849-1920), the son of an Italian language professor, who had operated a photographic portrait studio in Brighton under the trade name of Lombardi since the mid 1860s. 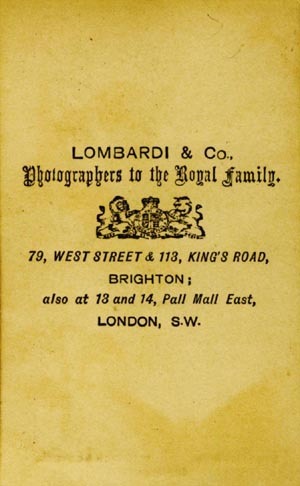 After the formation of the partnership between Eugenio Martinucci, Burt Sharp and Robert Hatt the photographic studio at 113 King's Road, Brighton went under the name of Lombardi & Co. Soon after Robert Hatt's arrival in Brighton, Lombardi & Co. opened a second studio at 79 West Street, Brighton. When Eugenio Martinucci moved to London in 1877 to join the Italian photographer Leonida Caldesi (1822-1891) at Caldesi's studio at 13 Pall Mall East, London, he left the two Brighton studios in the hands of his two partners Robert Hatt and Burt Sharp. On 28th February 1875, Robert Hatt married Emma Elizabeth Pleasant (born 1841, Paddington) in Brighton. After her marriage, Emma Elizabeth Pleasant was generally known to family members and friends as "Elizabeth". In the Spring of 1876, Robert's wife Elizabeth gave birth to a son named Robert Aspland Hatt. Robert was to be the couple's only surviving child. At the time of the 1881 census, Robert Hatt was residing in the village of Preston on the outskirts of Brighton. Robert Hatt, who is entered on the census return as a thirty-seven year old "Photographic Artist", was living at Preston Farm Cottage, South Road, Preston, with his wife Elizabeth and their five year old son, Robert Aspland Hatt. Sharing Robert Hatt's home was his twenty-four year old niece Gertrude Whiting (entered on the census return as 'Gertrude White') described as a "Photo Retoucher" and presumably employed at the Lombardi & Co. studio in King's Road, Brighton. In the 1880s, Robert Hatt also worked from a studio at 52 Clarence Square, Brighton. In 1878, 52 Clarence Square, Brighton, was not occupied, but the adjoining building at No 51 Clarence Square was being run as a lodging house by Mrs Elizabeth Hemmings (1824-1884) and her daughter Sophia Hemmings (born 1853, Brighton). Around 1880, Mrs Hemmings appears to have let out part of the adjoining building (No. 52) to Robert Hatt and Burt Sharp of Lombardi & Co. (Brighton). The 1881 census records twenty-eight year old Miss Sophia Hemmings as a "Photographer's Assistant" residing at 51 Clarence Square, Brighton. Based next door at 52 Clarence Square were two photographers - Frank Hayes (born c1862, London) described as a "Photographer, aged 19" and William Aspland Whiting (entered on the census return as 'William A. White') described as an "Assistant Photographer". Although Frank Hayes is entered on the census return as the Head of Household, the relationship of both photographers to the Head of Household is given as "Nephew". The young photographer William Aspland Whiting (White) was the brother of Gertrude Aspland Whiting (White), the "Photo Retoucher" residing with Robert and Elizabeth Hatt, her aunt and uncle, at their home at Preston Farm Cottage, on the outskirts of Brighton. 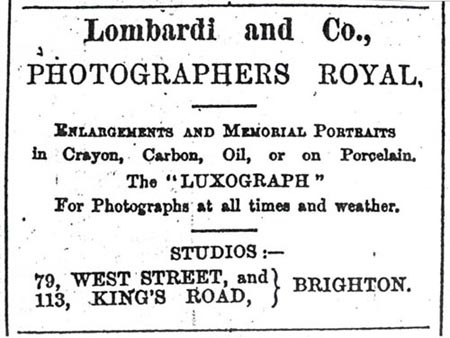 Robert Hatt (1843-1918), who had previously run his own photographic studio in the New Cross area of London, appears to have taken charge of the original Lombardi studio at 113 King's Road, Brighton. The new studio at 79 West Street, Brighton probably became the responsibility of the less experienced photographer Burt Sharp, who was then in his mid twenties. In 1880, Eugenio Martinucci, who had settled in London with his wife and family, dissolved his partnership with Robert Hatt and Burt Sharp. Martinucci had decided to give up his studios in Brighton and concentrate on his photographic publishing business in the capital. The Lombardi studios in Brighton passed into the hands of Martinucci's former partners Robert Hatt and Burt Sharp, who retained the firm's name of Lombardi & Co. 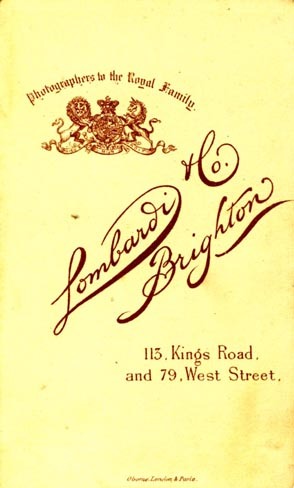 In the 1880s, Robert Hatt and Burt Sharp, with the help of a number of young assistants ( including Hatt's nephew and niece), ran three studios in Brighton under the name at Lombardi & Co. (Brighton). Robert Hatt managed the studio at 113 King's Road and was in charge of operations at 52 Clarence Square, Brighton. Hatt's partner, Burt Sharp, who specialised in "outdoor photography" was based at 79 West Street, Brighton, the site of Lombardi & Co.'s "Equestrian Grounds". Robert Hatt and Burt Sharp continued as business partners under the studio name of Lombardi & Co. (Brighton) up until the end of 1883. The partnership between Robert Hatt and Burt Sharp (trading as Lombardi & Co. of Brighton) was dissolved on 1st January 1884. 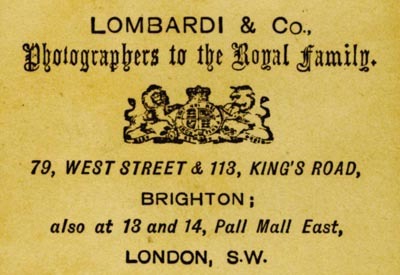 The long established Lombardi studio at 113 King's Road, Brighton was closed in 1884, but it appears Robert Hatt continued as a photographer at Lombardi's auxiliary studio at 52 Clarence Square, Brighton. In January 1885, Robert Hatt was still working as a photographer in Brighton at 52 Clarence Square and trading under the name of Lombardi & Co. The second Lombardi studio at 79 West Street, Brighton was continued by Burt Sharp under his own name. 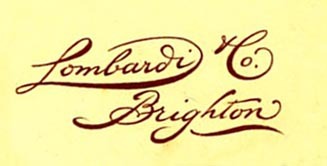 [ABOVE ] The trade plate of Lombardi & Co. of Brighton, produced when the Lombardi studios in Brighton were being run by Robert Hatt and his partner Burt Sharp. It appears that by the Summer of 1885, Robert Hatt had left Brighton to work in Eugenio Martinucci's Lombardi Studio in London. On 26th August 1885, Robert Hatt was the subject of a County Court Judgement in connection with Lombardi & Co. of 13 Pall Mall East. By February 1888, Robert Hatt was working as a photographer at 75 New Cross Road, London. 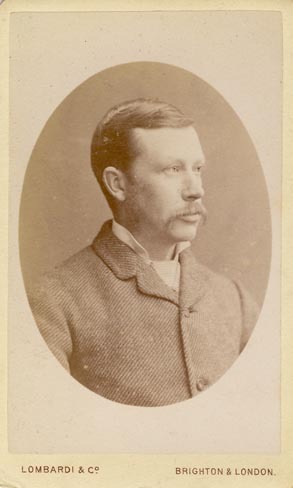 (Source: copyright registration for the portrait of Sir R. W. Carden, dated 1st February 1888). Around 1889, Robert Hatt acquired the studio of "Napoleon Syrus" at 235 Balls Pond Road, Islington, London. "Napoleon Syrus" was the pseudonym of James Syrus Tulley (c1827-1891). James Tulley had previously worked as a photographer in Sheffield and had also performed as a music hall artist under his assumed name of "Napoleon Syrus". Robert Hatt operated from Napoleon Syrus's former studio at 235 Balls Pond Road, Islington, until 1899. Around 1893, Robert Hatt opened a second photographic portrait studio at 184 Balls Pond Road, Islington, London. In 1895, Robert's wife, Mrs Emma Elizabeth Hatt, died in Islington, London, at the age of 53. 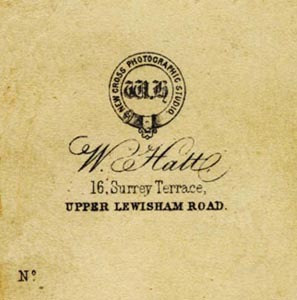 In 1899, Robert Hatt closed his photographic studio in Balls Pond Road. By 1901, Robert Hatt had retired as a professional photographer. The 1901 census records Robert Hatt, described as a 57 year old widower, residing at 55 Leswin Road, Stoke Newington, North London. On the 1901 census return, Robert Hatt's occupation is given as "Retired Photographer". On 24th February 1912, Robert Hatt, then a sixty-nine year old widower, married Louisa Crowder Coleman (born 1856, Camberwell), a fifty-five year old spinster. Robert Hatt died on 21st October 1918 at St Peter's Hospital, Wandsworth, at the age of 75. [ABOVE ] The trade plate of Lombardi & Co. Photographers to the Royal Family, 79 West Street & 113 King's Road, Brighton and at 13 & 14 Pall Mall East, London, S.W. 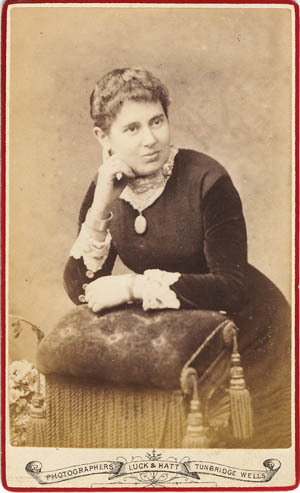 as printed on the reverse of carte-de-visite portrait (c1877). Robert Hatt was in charge of Lombardi & Co.'s studio at 113 King's Road, Brighton from the mid 1870s. [ABOVE] An advertisement for Lombardi & Co., Photographers Royal, of 79 West Street and 113 King's Road. Brighton which appeared in the Cliftonville & Hove Mercury on Friday, 2nd May 1879. By this date Eugenio Martinucci had left Brighton for London and the two Lombardi studios in Brighton were being managed by his two business partners Robert Hatt and Burt Sharp. 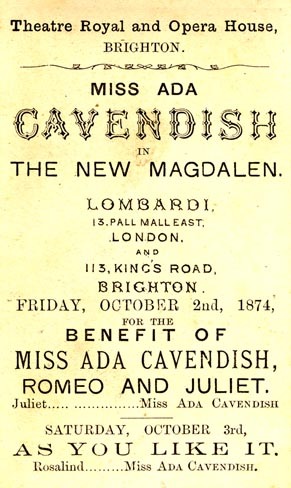 [ABOVE] An advertisement for Messrs. Lombardi & Co.'s two Brighton studios which appeared in the Brighton Examiner newspaper on 11th January 1881. 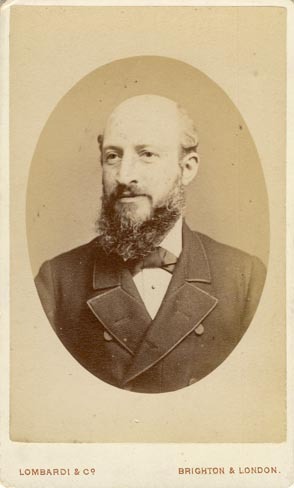 Eugenio Martinucci had left Brighton for London in 1877 and three years later he passed the Brighton studios to his former partners, Robert Hatt and Burt Sharp. The studio at 113 King's Road, which had been established around 1863, appears to have been managed by Robert Hatt, and the new studio at 79 West Street, which opened its doors about 1874, became the responsibility of Burt Sharp. 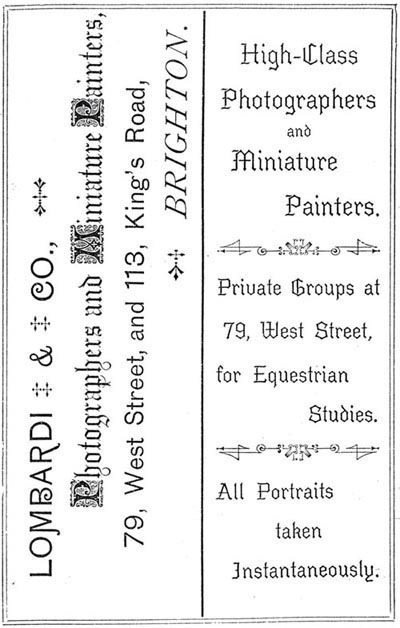 [ABOVE] An 1882 advertisement for Lombardi & Co., Photographers and Miniature Painters of 79 West Street and 113 King's Road, Brighton, which appeared in the 1882 edition of Daniel B. Friend's Brighton Almanack. It appears that studio portraits were taken by Robert Hatt at the studio in King's Road, while larger group portraits and "Equestrian Studies" in the "extensive studio grounds" at 79 West Street, Brighton, were photographed by Burt Sharp. Photographs produced by Robert Hatt at the Brighton studio of Lombardi & Co.
Robert Hatt produced a number of photographic portraits which were copyrighted by Lombardi & Co. For instance, on 26th January 1885, Robert Hatt registered for copyright photographs of the military hero Colonel Frederick Burnaby and his wife Elizabeth. Colonel Frederick Gustavus Burnaby (1842-1885) had married Elizabeth Hawkins-Whitshed (1860-1934) six years previously in 1879. Colonel Frederick Burnaby and his wife were photographed by Robert Hatt at Lombardi & Co.'s auxiliary studio at 52 Clarence Square, Brighton. Mrs Burnaby was photographed in "riding habit" and holding a "whip in hands". Robert Hatt was using 52 Clarence Square as his main studio in Brighton for a short period between 1884 and 1885 - too brief for the studio to make an appearance in local trade directories. 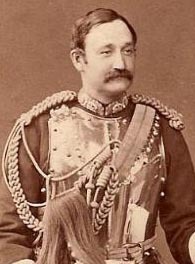 Colonel Frederick Gustavus Barnaby, a well-known personality in Victorian England, was killed during hand-to-hand fighting in the Sudan on 17th January 1885. Colonel Burnaby's heroic death probably prompted Robert Hatt to register his photographs for copyright, realising there would be public interest in one of the last photographs taken of Colonel Burnaby with his young wife. Leading photographers made portraits of the famous personalities of the day, which were then issued in carte- de-visite format and sold through retail outlets such as print sellers, stationers, booksellers and fancy goods shop. The retail trade dealt with cdv portraits of statesmen, politicians, actors, authors, artists, entertainers and other famous people. [ABOVE] Colonel Frederick G. Burnaby (1842-1885) of the Royal Horse Guards. 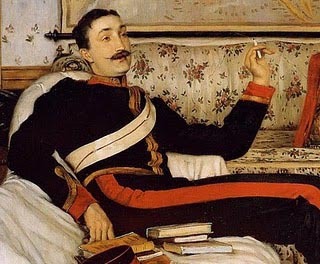 [ABOVE] A portrait of Frederick Gustavus Burnaby, painted by James Jacques Tissot in 1870. [ABOVE] A carte-de-visite portrait of an unidentified girl photographed at Robert Hatt's photographic studio at 235 Balls Pond Road, Islington.(c1898). [ PHOTOGRAPH: Courtesy of Mr & Mrs Leeds ] [ABOVE] A detail from the carte-de-visite portrait shown on the left. The subject of the photograph is believed to have been related to the Hatt family. [ABOVE] An outdoor group portrait photographed by Robert Hatt of 235 Balls Pond Road, Islington (c1897). The 1881 census records two members of the Whiting Family working alongside the photographer Robert Hatt at the Lombardi studios in Brighton - twenty-four year old Gertrude A. Whiting, employed as a "Photo Retoucher" and fourteen year old William A. Whiting an "Assistant Photographer". Gertrude Aspland Whiting (born 1857, Regents Park, Middlesex) and William Aspland Whiting (born c1864, London) were the children Annie Aspland Hatt and William Whiting, a surgical machinist who later became a professional photographer. 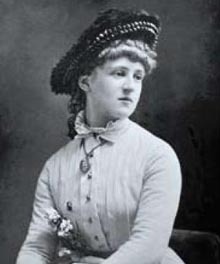 Annie Aspland Hatt, the mother of Gertrude Aspland Whiting and William Aspland Whiting, was Robert Hatt's elder sister. Annie Aspland Hatt (born c1826, Islington) was the daughter of Francis Hatt (born 1796) and Alice Aspland Cross (c1801-1878) and the sister of professional photographers William Hatt (1836-1869), Robert Hatt (1842-1918), Emma Jane Hatt (1840-1873) and Frederick Lindon Hatt (1844-1919). It appears that as a young man William Whiting (born c1817, Marylebone) had married a woman named Mary Ward (a marriage between William Whiting and Mary Ward was recorded in 1835). This union between William Whiting and Mary Ward produced a number of children, several of whom died in infancy. Two of Mary and William Whiting's sons who reached adulthood were Arthur William Whiting (1841-1869) and Charles Rowland Whiting (1844-1895) and they, like their father William Whiting, became professional photographers. According to David Webb of the PhotoLondon website, William Whiting senior, who was a "surgical machinist" by profession, had taken up photography to record the results of surgical corrections to deformity. ( In the 1861 census, William Whiting's son Arthur William Whiting is described as a "photographic operator" and "surgical instrument maker" residing with his father and brothers at 28 High Street, Camden Town). Around 1865, two of William Whiting senior's sons Arthur William Whiting and Charles Rowland Whiting formed a business partnership and operated a photographic studio at 56 High Street, Camden Town, London. 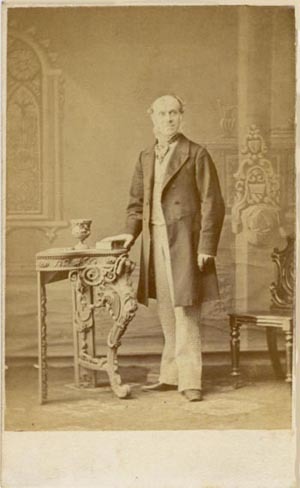 When Arthur Whiting died in 1869 at the age of 28, the studio in Camden Town's High Street was continued by Charles Rowland Whiting under the name of The Camden Photographic Studio. Details of Charles Rowland Whiting's distinguished photographic career are provided by David Webb on the PhotoLondon website. David Webb has discovered that Charles Rowland Whiting was a member of The Photographic Society (later known as the The Royal Photographic Society) and provided instruction in "wet-plate photography" at the Polytechnic School of Photography. 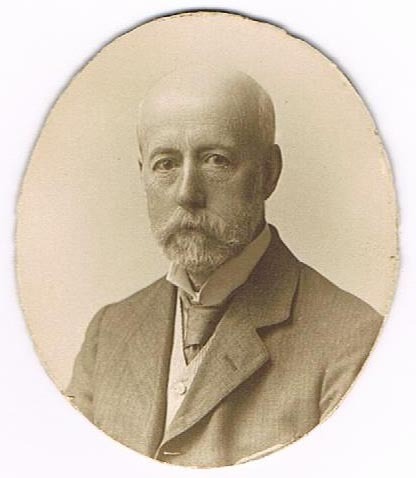 Charles Rowland Whiting was also a founder member of the West London Photographic Society and participated in the Ealing Photographic Society. 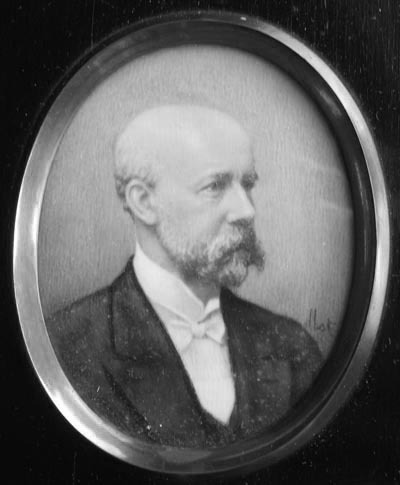 Charles Rowland Whiting was awarded medals for the photographs he exhibited at the Pall Mall Gallery [e.g. "Early morning, Hastings" (1894)] and worked for many years as a photographer for the Heliotype Company and the Woodbury Company (Woodburytype Permanent Photographic Printing Company). In 1864, Charles Rowland Whiting had married Susannah Pride (born 1839, St Pancras, London). Charles and Susannah Whiting produced three children - Roland Charles William Whiting (born 1864), Edith Whiting (born 1869) and Ernest Whiting (born c1871). Between 1872 and 1878, Charles Rowland Whiting operated a photographic studio at 4 Ingham Place, Wood Lane, Shepherd's Bush. On the 1881 census return, Charles Rowland Whiting's eldest son Roland C. W. Whiting was described as a "Photographic Assistant". Presumably, at a later date, Ernest Whiting also worked as a photographer, because their father's studio at 370 Uxbridge Road, Shepherd's Bush, London, went under the name of Charles Rowland Whiting & Sons between 1884 and 1887. Charles Rowland Whiting died from a brain tumour in the town of Ealing on 6th October 1895, at the age of 51. William Whiting (born c1817, Marylebone) initially worked as a "Surgical Machinist", but he later employed photography as an aid to his surgical work. David Webb notes that William Whiting "took up photography to record the progress of his cures in cases of deformity". 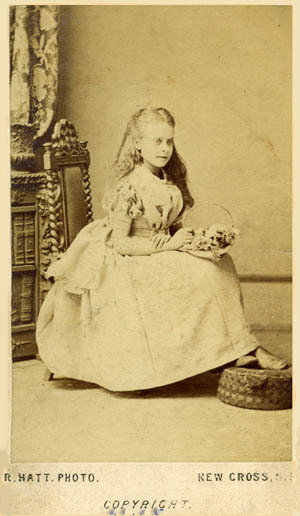 William Whiting had two sets of children by two different women (Mary Ward and Annie Aspland Hatt), yet not only did he pursue a career in photography, but children from both relationships became professional photographers. (Arthur William Whiting and Charles Rowland Whiting / William Aspland Whiting and Gertrude Aspland Whiting). When William Whiting fathered his two children by Annie Aspland Hatt he was primarily employed as a "surgical machinist", but, by the time the 1871 census was taken, he was working as a professional photographer. The 1871 census records William Whiting, his 'common law' wife Annie Whiting (Aspland Hatt) and their two children, Gertrude Aspland Whiting and William Aspland Whiting at 2 Mason Grove, Mason Street, Deptford. On the census return, William Whiting senior is described as a fifty-four year old "Photographer". [ABOVE ] The trade plate of Aspland Whiting, Art Photographer of 314 Holloway Road, North London, which appeared on the reverse of a stereo portrait produced at Aspland Whiting's Loraine Art Studio in North London. 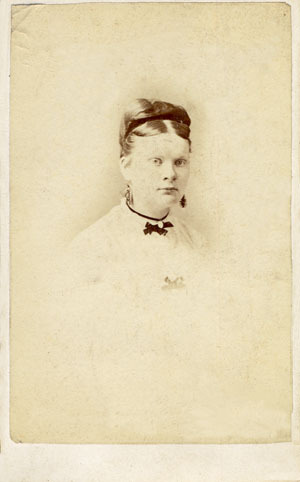 In 1881, twenty-four year old Gertrude Aspland Whiting and her fourteen year old brother William Aspland Whiting were assisting Robert Hatt at one of the Lombardi studios in Brighton. Gertrude Aspland Whiting (born 1857, Regents Park, Middlesex) and William Aspland Whiting (born c1864, London) were the children of William Whiting and his second wife Annie Aspland Hatt. By the time the 1891 census was taken, Gertrude Aspland Whiting and her brother William Aspland Whiting had returned to their mother's home in Islington, North London. The 1891 census return shows Gertrude A. Whiting and William A. Whiting residing with their widowed mother, sixty-eight year old Mrs Ann A. Whiting, at 62 Ronalds Road, Islington, London. Gertrude Aspland Whiting is described on the census return as a thirty-four year old "Photographic Artist" and her twenty-six year old brother William Aspland Whiting is recorded as "Photographer". On 19th December 1892, at Islington Register Office, William Aspland Whiting married Emma Anna Latham (born 1854, Clerkenwell, London), a former governess. Emma Latham was the eldest daughter of Emma Trend and William Daniel Latham, a London labourer. On the marriage certificate, Emma Latham gives her age as 36. At the time of his marriage, William Aspland Whiting is recorded as a "Photographer", aged 28. After their wedding, William Aspland Whiting joined his wife at her home at 21 Hornsey Rise, Highgate, Islington. It was while living in North London in the 1890s, that William Aspland Whiting and his sister Gertrude Aspland Whiting established a photographic art studio above a fur shop at 314, Holloway Road, North London. (In the London Post Office Directory of 1895, Charles Fischer is listed as a furrier at 314, Holloway Road, London, N.) Called the Loraine Art Studio because of its location opposite Loraine Place, North London, the Aspland Whiting studio produced portraits in a variety of formats including carte-de-visite, cabinet and stereo cards. On 20th April 1900, Gertrude Aspland Whiting married Reginald Douglas Barrett (born 1845, Budleigh Salterton, Devon), a professional photographer from Bridport, Dorset. On the marriage document, Gertrude gives her age as 42, and her husband Reginald Barrett is recorded on the certificate as a 54 year old "Photographer". Reginald Douglas Barrett was the son of an artist and photographer named William Barrett, who had a studio in South Street, Bridport. Reginald Barrett and his father were in business as photographers at 71 South Street, Bridport, for many years, trading under the name of Barrett & Son. Reginald Barrett took over the studio in South Street when his father died. In both the 1901 and 1911 census, Reginald and Gertrude Barrett are shown living at 71 South Street, Bridport, Dorset. No profession is given for Mrs Gertrude Barrett (Aspland Whiting), but her husband, Reginald Douglas Barrett is recorded on both census returns as a "Photographer" working "at home" on his "own account". However, given her long experience in photography, it is likely that Gertrude assisted her husband in his studio. It appears that the Aspland Whiting studio at 314 Holloway Road was in business from about 1895 until around 1900. The studio might have closed after Gertrude Aspland Whiting left North London to live with her new husband in Bridport, Dorset. William Aspland Whiting remained in North London after his sister Gertrude's departure. At the time of the 1901 census, William Aspland Whiting was recorded as a "Photographer" at 21 Hornsey Rise, Highgate, Islington, but as his occupational status is given as "Worker" rather than "Employer" or "Working on his own account", I presume by this date he was no longer running his own studio at 314, Holloway Road, North London. 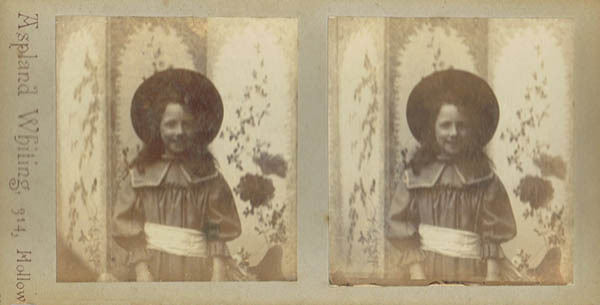 [ABOVE ] The trade plate of Aspland Whiting, Art Photographer, of 314 Holloway Road, London, printed on the reverse of a stereo portrait of a girl. (See above). It is interesting that Aspland Whiting is described as an "Art Photographer" in this printed publicity. When the 1911 census was taken ( long after the Aspland Whiting studio had closed), William Aspland Whiting is described on the census return for 21 Hornsey Rise, Islington, as an "Art Photographer". [ABOVE ] The trade plate of Aspland Whiting of 314 Holloway Road, London, which appears at the foot of a cabinet portrait produced around 1895. Eliza Hatt was born in London on 6th July 1832. 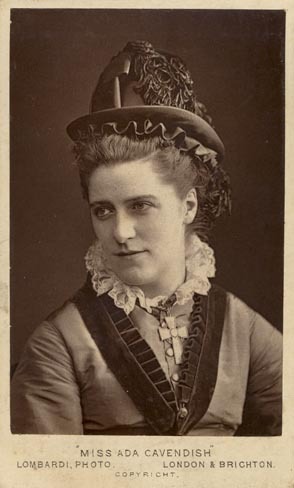 Eliza Hatt was a daughter of Francis Hatt and Alice Aspland Cross and an elder sister of the photographers William Hatt, Robert Hatt, Emma Jane Hatt and Frederick Lindon Hatt. On 25th May 1859 Eliza Hatt married Frederick Archibald Pavey, a cabinet maker from Plymouth, at a church in St. Pancras, North London. Frederick Archibald Pavey and his wife Eliza went on to produce at least three children - Alice Adeline Pavey (born 1860, Bayswater), Alfred Archibald Pavey (born 1861, St Pancras, London) and Beatrice Eliza Pavey (born 1864, St Pancras). At the time of the 1881 census, Frederick and Eliza Pavey (Hatt) were living at 7 Chippenham Road, Paddington, London with Alice (21), Alfred (19) and Beatrice (17), together with Alfred's wife, Jane, aged 24, and two grandchildren, Alice's four year old daughter Kate Pavey and one year old Frederick Pavey. 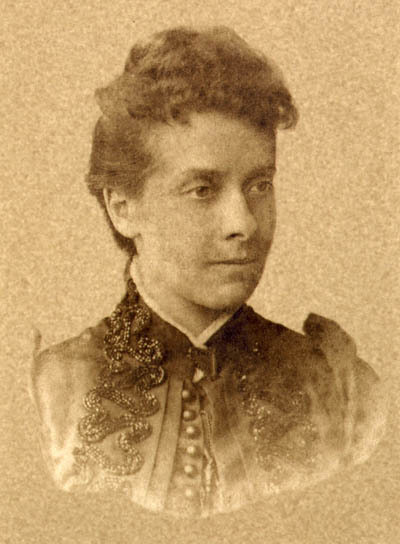 Alice Adeline Pavey was born in Bayswater, West London, on 5th March, 1860, the eldest child of Eliza Hatt and Frederick Archibald Pavey, a Plymouth-born cabinet maker. When she was about 10 years of age, Alice Pavey was taken to her Uncle Robert's photographic studio in New Cross to have her portrait taken. 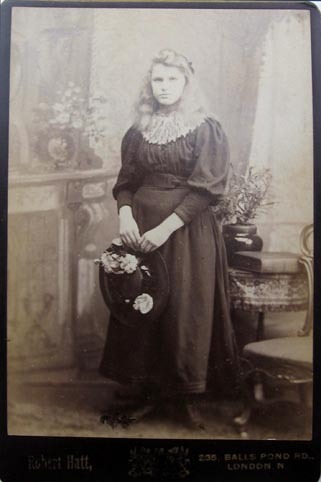 (A carte-de-visite portrait of Alice Pavey, taken around 1870 at Robert Hatt's studio at 16 Surrey Terrace, New Cross, is illustrated below). [ABOVE ] A carte-de-visite portrait of Alice Adeline Pavey, photographed at Robert Hatt's photographic studio at 16 Surrey Terrace, Counter Hill, New Cross, S.E. London (c1870). The photographer Robert Hatt was Alice Pavey's uncle. [ABOVE ] The trade plate of Robert Hatt, Photographer of 16 Surrey Terrace, Counter Hill, New Cross, S.E. 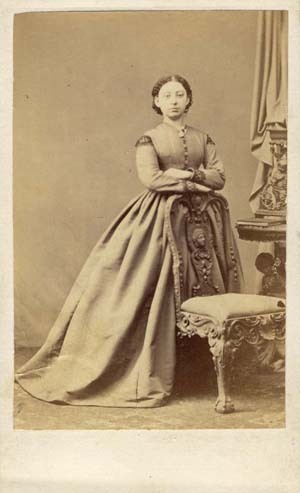 London, as printed on the reverse the carte-de-visite portrait of Alice Pavey, above (c1870). Early in 1877, Alice, who was then an unmarried girl of 16, gave birth to a baby girl named Kate Florence Pavey. [The birth of Kate Florence Pavey was registered in the London district of Westminster during the 2nd Quarter of 1877]. When the census was taken on 3rd April 1881, Alice Pavey was a single woman of 20 living with her young daughter, her parents and two younger siblings at 7 Chippenham Road, Paddington, London. At this time Alice was working as a florist. Alice's younger brother, nineteen year old Albert Pavey was employed as a fitter for a firm that built conservatories and her seventeen year old sister Beatrice Pavey had found a position as a "servant". An unmarried mother in her early twenties, Alice Pavey began a relationship with John Alfred Chantler (born 1857, Gravesend, Kent). At the end of 1884, Alice gave birth to a baby daughter named Rosa Georgiana Chantler. 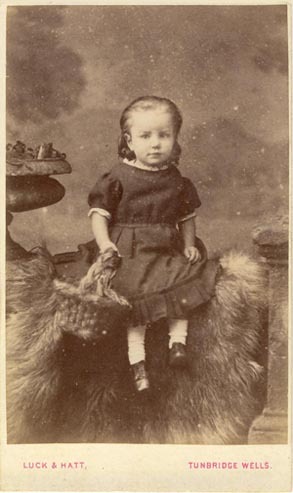 Five years later, Alice Pavey was still living with John Alfred Chantler, giving birth to another baby girl, Beatrice Ada Chantler during the 3rd Quarter of 1889. John Alfred Chantler, Alice's partner and father of two of her three daughters, died in Wandsworth, South London, in 1890 at the age of 30. [ABOVE ] Mrs Alice Adeline Kelley (formerly Pavey), photographed at Aspland Whiting's photographic studio at 314 Holloway Road, North London. [ABOVE ] The trade plate of Aspland Whiting, Art Photographer of 314 Holloway Road, London. 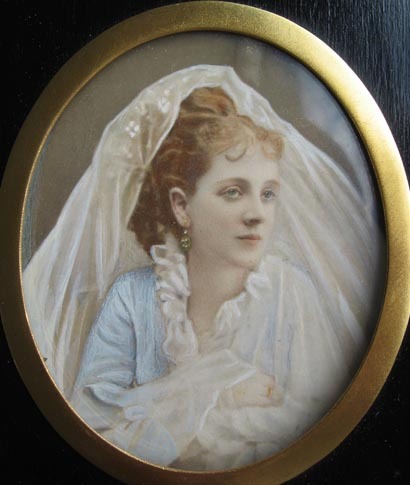 In 1889, Beatrice Pavey, Alice Pavey's twenty-five year old sister, had married John William Kelley (born 1866, Burton-on-Trent, Staffordshire ), a young man who worked alongside his widowed mother Mrs Theresa Kelley at her grocer's shop at 42 Chippenham Road, Paddington. Kelley's grocery store in Chippenham Road had previously been run by John Kelley senior (born c1827, Devon), but he had died in 1880 at the age of 53. The Kelleys lived in the same road as the Pavey family and John William Kelley, Beatrice Pavey's husband, had a younger brother called Charles Frederick Kelley (born 1872, Paddington). In 1893, Alice Adeline Chantler (Pavey), a thirty-three year old mother with three fatherless children, married twenty-one year old Charles Frederick Kelley, the brother of her sister's husband. The following year, Mrs Alice Kelley (formerly Pavey) gave birth to a son named Charles Kelley. [The birth of Charles Kelley junior was registered in the South London district of Wandsworth during the 2nd Quarter of 1894. When the 1901 census was taken Mrs Alice Adeline Kelley (Alice Pavey) was living with her husband and young son at 15 Cirencester Street, Paddington. On the census return, Alice's husband, Charles Kelley, is described as a thirty year old "Greengrocer". [ABOVE ] Mrs Alice Adeline Kelley (formerly Pavey), photographed with her children at the Aspland Whiting studio at 314 Holloway Road, North London (c1895). Alice Pavey's eldest daughter Kate Florence Pavey (born 1877, Westminster) wears a dark dress and is seated on her mother's left. Standing in front of Kate is her half-sister Beatrice Ada Chantler (born 1889). Perched on Alice's lap is young Charles Kelley (born 1894, Tooting, London). Seated on the far left is Rosa Georgiana Chantler (born 1884). 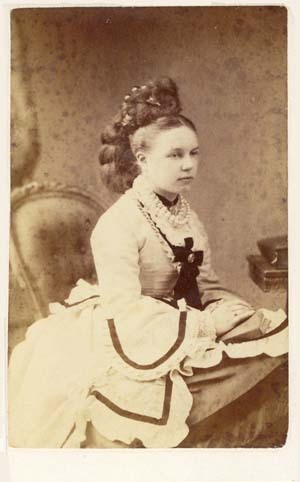 When this photograph was taken, Alice was aged around 35 and had been married to Charles Frederick Kelley (born 1872, Paddington) for about two years. Around 1895, Mrs Alice Adeline Kelley (Pavey) paid a visit to the Aspland Whiting Studio in Holloway Road, North London, a photographic studio operated by her cousin William Aspland Whiting, the son of William Whiting and her mother's sister Ann Aspland Hatt. Alice brought along her four children to be photographed in a group portrait. 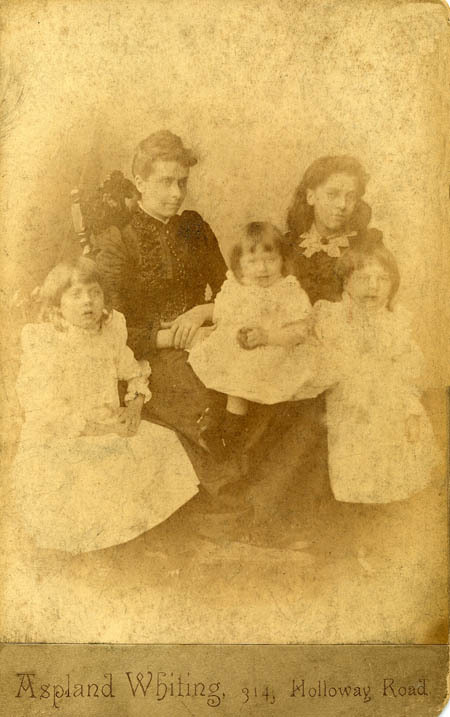 Alice posed alongside her teenage daughter Kate Florence Pavey, six year old Beatrice Ada Chantler and eleven year old Rosa Georgiana Chantler (the daughters of John Alfred Chantler) and the latest addition to the family, Charles Kelley junior, who had been born during the second quarter of 1894. When the 1911 census was taken, Alice and Charles Kelley and their seventeen year old son, Charles Kelley junior, were residing at 8 Paddington Green, Paddington, London. Alice's husband, Charles Kelley senior, was no longer working as a green grocer. On the census return he is described as a 40 year old "Licensed Messenger". Charles Kelley's teenage son, Charles Kelley junior, was employed as a "clerk". It appears that the Kelley family supplemented their income by taking in lodgers. The 1911 census records two boarders at Mrs Alice Kelley's home - William Nixon a thirty-two year old "Comedian" from Leeds and Bertram Watson, an eighteen year old "Page" from Eastbourne in Sussex. Mrs Alice Adeline Kelley (Pavey) died in Brighton, Sussex, in 1939, aged 78. 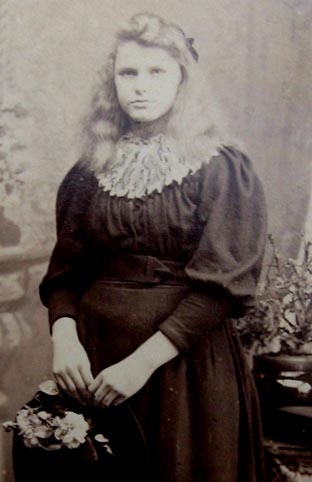 Alice Adeline Pavey had two younger siblings - Alfred Archibald Pavey (born 1861, St Pancras, London) and Beatrice Eliza Pavey (born 1864, St Pancras, London). In 1880, Alfred Pavey married Jane Bean (born 1856, Lilley, Hertfordshire). At the time of the 1881 census, Alfred Pavey, described on the census return as a nineteen year old "Conservatory Fitter", was living with his twenty-four year old wife Jane at his parents' house at 7 Chippenham Road, Paddington, London. Three children were born over a period of 6 years - Alice Lena Pavey (born 1883, Paddington), Florence Eliza Pavey (born 1884, Paddington) and James Alfred Pavey (born 1887, Paddington - birth registered as Alfred James). When the census was taken on 5th April 1891, Alfred Pavey and his family were living at 5 Orchard Street, Paddington. On the census return, Alfred Pavey is recorded as a twenty-nine year old conservatory fitter. 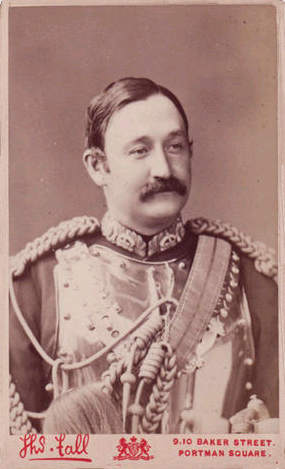 Alfred Archibald Pavey died in Paddington in 1898 at the age of 37. In 1889, Beatrice Eliza Pavey (born 1864, St Pancras), married 23 year old grocer's assistant John William Kelley (born 1866, Burton-on-Trent, Staffordshire). By the time the 1901 census was taken, Beatrice and John Kelley were both living in Putney. John W. Kelley had found employment as a "Florist's Carman" and Mrs Beatrice Kelley (Pavey) was earning money as a "Temporary Domestic". In 1911, Mrs Beatrice Kelley (Pavey) was living at 14 Stanbridge Road, Putney with her husband John William Kelley, who was now working as a greengrocer. Mrs Beatrice Kelley (Pavey) died in Putney in 1926, aged 62. Emma Jane Hatt was born in Islington in 1840, the youngest daughter of Francis Hatt (born 1796) and Alice Aspland Cross (c1801-1878). When the 1871 census was taken, Emma Jane Hatt was recorded at 16 Surrey Terrace, Upper Lewisham Road, New Cross, Deptford, the location of the photographic studio previously owned by her late brother William Hatt (1836-1869). 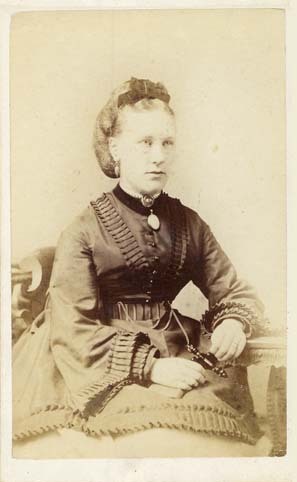 On the census return, Emma Jane Hatt is described as a "Photographer", aged 31. At the time of the 1871 census, Emma and her brother Robert Hatt (1843-1918) were running the photographic portrait studio at 16 Surrey Terrace, Deptford. Emma's photographic career was cut short by her death two years later. Emma Jane Hatt died in the district of Camberwell during the 4th Quarter of 1873, at the age of 33. [ABOVE ] The trade plate of Robert Hatt, Photographer of 16 Surrey Terrace, New Cross, S.E. London, as printed on the reverse of carte-de-visite portrait (c1870). 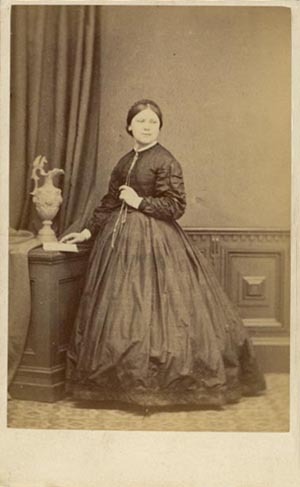 Emma Jane Hatt, Robert Hatt's sister, was employed as a photographer at 16 Surrey Terrace during the early 1870s. [ABOVE ] A portrait of Annie Marie Green (1852-1919), the wife of Frederick Lindon Hatt. 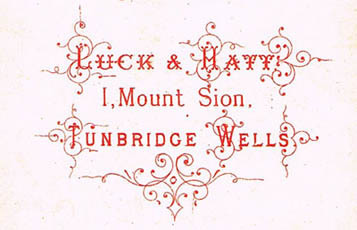 [ABOVE ] The trade plate of Luck & Hatt of 1 Mount Sion, Tunbridge Wells, Kent (c1878) Frederick Lindon Hatt entered into partnership with the Tunbridge Wells photographer Walter Luck around 1876. The partnership of Luck & Hatt were in business until around 1882, the year Frederick Lindon Hatt moved to Bristol to set up his own photographic studio at the Triangle in Clifton. [ABOVE ] A cabinet portrait of a seated man, photographed in his garden by Frederick Lindon Hatt of 25 Triangle, Queens Road, Clifton, Bristol. In 1894, The Autotype Company showed a picture entitled "Little Miss Wilson" at the 39th Annual Exhibition of the Photographic Society of Great Britain. The photograph, which employed the 'Carbon Print Process', was produced from a "negative by Lindon Hatt". Frederick Lindon Hatt was born in Islington, North London, on 25th November 1844, the youngest of four sons born to Francis Hatt (born 1796) and Alice Aspland Cross (c1801-1878). In 1861, Frederick Lindon Hatt was recorded as a photographer at 6 Ranelagh Road, Westbourne Square, Paddington, where he was residing with his brother Robert Hatt (1843-1918), who was also a professional photographer (see above). On 13th April 1875, Frederick Lindon Hatt married Annie Marie Green (born 1852, Wolverhampton, Staffs.) in the parish of Wednesfield, Staffordshire. The couple were to produce two children - Frederick Lindon Hatt junior, who was born in Tunbridge Wells, Kent, on 8th March 1876, and Nora Ethel Hatt, who was born in Tunbridge Wells towards the end of 1879. [The birth of Nora Ethel Hatt was registered in the District of Tunbridge during the 4th Quarter of 1879]. 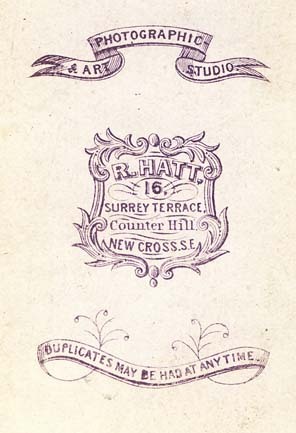 [ABOVE ] The trade plate of Luck & Hatt, photographers of 1 Mount Sion and 18 Royal Parade, Tunbridge Wells, Kent (c1882). 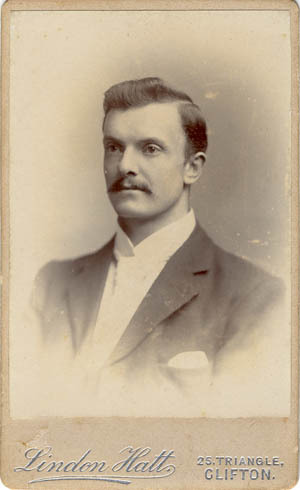 Around 1876, shortly after his marriage to Annie Green, Frederick Lindon Hatt entered into partnership with the Tunbridge Wells photographer Walter Luck (born 1854, Tunbridge Wells, Kent). 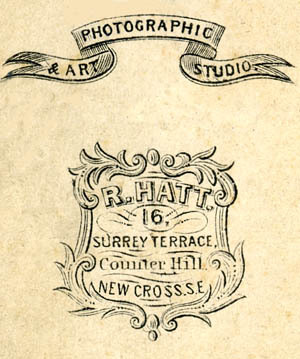 The partnership of Luck & Hatt ran studios in Tunbridge Wells, Kent, between 1876 and 1882. The two photographers practised from a single studio at 1 Mount Sion, Tunbridge Wells, Kent up until about 1881, when they opened a second studio in the town at 18 Parade, Tunbridge Wells. 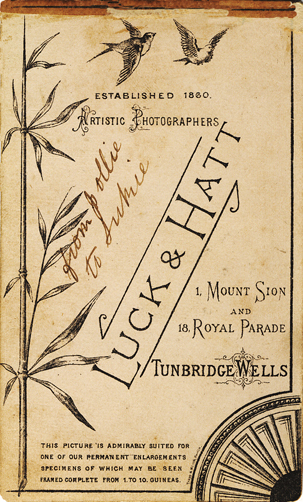 In 1882, Walter Luck and Frederick Hatt were operating from two studios, one photographer being based at 1 Mount Sion, the other attending the studio at 18 Parade, Tunbridge Wells. Between 1881 and 1882, Frederick Hatt resided at 55 Mount Sion, Tunbridge Wells. When the 1881 census was taken, Frederick Hatt, his wife Annie, and their two young children were recorded at their home at 55 Mount Sion, Tunbridge Wells. Frederick Hatt is described on the census return as a "Photographer", aged 36. By 1883, Frederick Hatt had left Tunbrige Wells and moved to Bristol where he opened a photographic studio at 25 Triangle, Queens Road, Clifton, Bristol. Frederick Hatt operated the Triangle studio under the name of "Lindon Hatt" for over fifteen years. Between 1888 and 1890, Lindon Hatt owned a second studio at 59 Triangle, Queens Road, Clifton, Bristol. Frederick Lindon Hatt's son joined his father in the photography business around 1895 and by 1908 their Clifton studio went under the name of Lindon Hatt & Son. From 1908 until 1911, the firm of Lindon Hatt & Son operated from a studio at 10 Whiteladies Road, Clifton, Bristol. Frederick Hatt later became a Churchwarden at St Michaels Church, Bristol. [ABOVE ] The trade plate of Lindon Hatt (Frederick Lindon Hatt) of 25 Triangle, Queens Road, Clifton, Bristol, as printed on the reverse of carte-de-visite portrait (c1888). 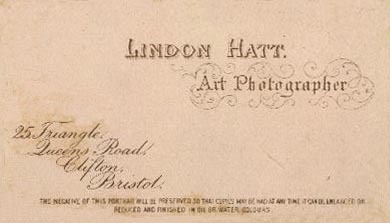 [ABOVE ] The name plate of Lindon Hatt (Frederick Lindon Hatt) photographer of 25 Triangle, Queens Road, Clifton, Bristol, taken from the foot of a carte-de-visite (c1890). 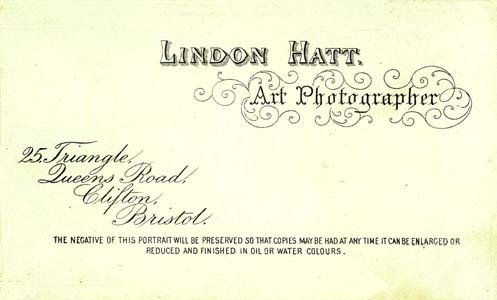 [ABOVE ] The name plate of Lindon Hatt (Frederick Lindon Hatt) photographer of 25 Triangle, Queens Road, Clifton, Bristol, taken from the foot of a carte-de-visite (c1900). After his marriage to Edith Gertrude Holmes in 1908, Frederick Lindon Hatt junior moved to Hackney in London, but his father continued the photography business in Bristol under the name of Lindon Hatt & Son. The 1911 census records (Frederick) Lindon Hatt senior as a 66 year old "Portrait Photographer" residing at 10 Whiteladies Road, Clifton, Bristol with fifty-eight year old Annie Marie Hatt, his wife of the past 36 years, and a 'live-in' servant, Agnes Yeates, a twenty-one year old single woman from Portbury, near Bristol. [ABOVE ] A portrait of the photographer Frederick Lindon Hatt (1844-1919). Frederick Lindon Hatt was thirty-two years of age when he joined Walter Luck at his studio in Tunbridge Wells. 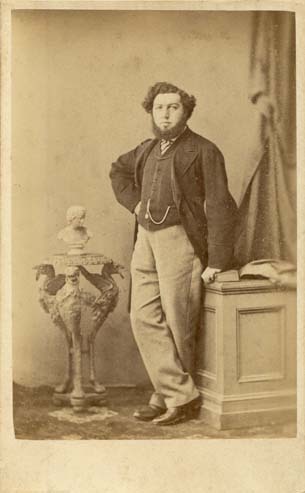 Frederick Lindon Hatt's business partner, Walter Luck, was only twenty-two when he combined forces with the experienced photographer from London to form the firm of Luck & Hatt. 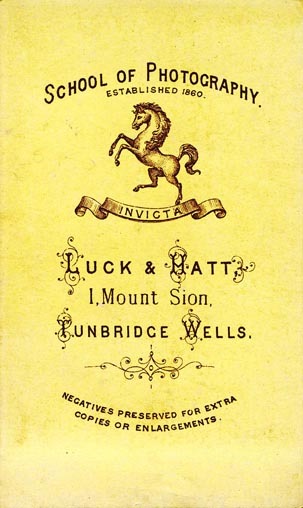 [ABOVE ] The design on the reverse of a carte-de-visite by Luck & Hatt advertising their two studios at 1 Mount Sion and 18 Royal Parade, Tunbridge Wells, Kent (c1882) Frederick Lindon Hatt entered into partnership with the Tunbridge Wells photographer Walter Luck around 1876. 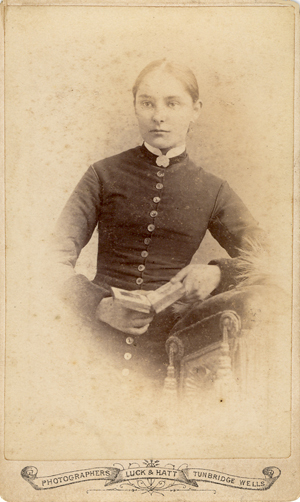 [ABOVE ] A carte-de-visite portrait of a young woman holding a small photo album by Luck & Hatt of 1 Mount Sion and 18 Royal Parade, Tunbridge Wells, Kent (c1882). Luck & Hatt's second studio at 18 Royal Parade (also simply known as the Parade) was opened around 1881. [ABOVE] The inscription on the reverse of the carte-de-visite photograph of the pet dog (see above) by the firm of Luck & Hatt of No. 1 Mount Sion, Tunbridge Wells, Kent (1877). The inscription identifies the pet dog as "Fossie Edwards, Aged 9yrs". The photo is dated "24th August 1877". [ABOVE ] The reverse of a carte-de-visite by Luck & Hatt of No. 1 Mount Sion, Tunbridge Wells, Kent (c1878). 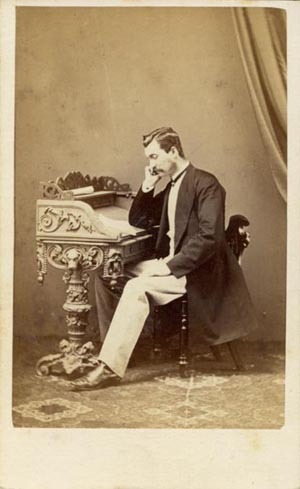 Frederick Lindon Hatt entered into a partnership with the photographer Walter Luck around 1876. Only the glue which fixed the original protective tissue remains on the back of the card. [ABOVE ] An earlier version of the design which appeared on the reverse of the cartes-de-visite produced at the Luck & Hatt studio at No. 1 Mount Sion, Tunbridge Wells, Kent. This design probably dates from 1876, the year that Frederick Lindon Hatt entered into the partnership with the photographer Walter Luck. [ABOVE ] A carte-de-visite portrait of a young girl holding a basket, photographed by the firm of Luck & Hatt of No. 1 Mount Sion, Tunbridge Wells, Kent (c1878). 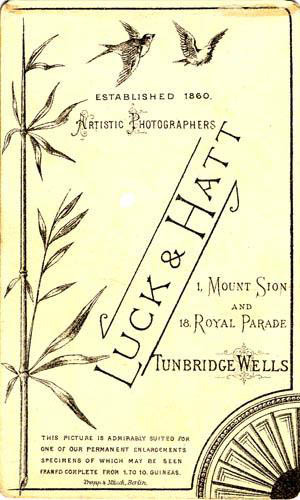 By 1881, Luck & Hatt had opened a second studio at 18 Royal Parade, Tunbridge Wells. [ABOVE ] A carte-de-visite portrait of an unknown woman by Luck & Hatt of 1 Mount Sion and 18 Royal Parade, Tunbridge Wells, Kent (c1882). Luck & Hatt's second studio at 18 Royal Parade (also simply known as the Parade) was opened around 1881. 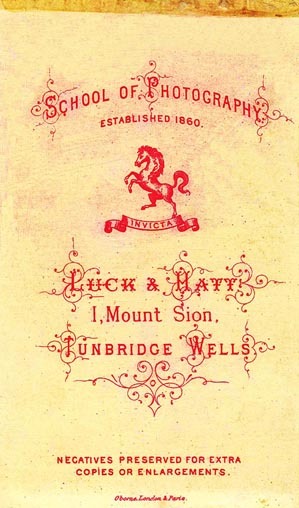 [ABOVE ] The design on the reverse of a carte-de-visite by Luck & Hatt advertising their two studios at 1 Mount Sion and 18 Royal Parade, Tunbridge Wells, Kent (c1882) Frederick Lindon Hatt entered into partnership with the Tunbridge Wells photographer Walter Luck around 1876. [ABOVE ] A portrait of the photographer Frederick Lindon Hatt around the time he ran the Lindon Hatt Studio in Clifton, Bristol. [ABOVE] The trade plate of Lindon Hatt (Frederick Lindon Hatt) of 25 Triangle, Queens Road, Clifton, Bristol, as printed on the reverse of carte-de-visite portrait (c1890). .
Frederick Lindon Hatt senior established a photographic studio in Bristol under the name of "Lindon Hatt" at 25 Triangle, Queens Road, Clifton, Bristol around 1883. Frederick Hatt operated the Triangle studio under the name of "Lindon Hatt" for over fifteen years. 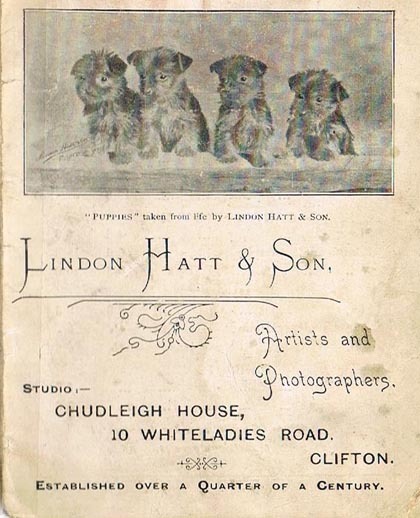 Between 1888 and 1890, Lindon Hatt owned a second studio at 59 Triangle, Queens Road, Clifton, Bristol. Frederick Lindon Hatt's son, Frederick Lindon Hatt junior joined his father in the photography business around 1895 and by 1908 their Clifton studio went under the name of Lindon Hatt & Son. From 1908 until 1911, the firm of Lindon Hatt & Son operated from a studio at 10 Whiteladies Road, Clifton, Bristol. Frederick Lindon Hatt junior moved to Hackney in East London, after his marriage in 1908, but his father continued the photography business in Bristol under the name of Lindon Hatt & Son.The 1911 census records (Frederick) Lindon Hatt senior as a "Portrait Photographer" residing at 10 Whiteladies Road, Clifton, Bristol. Frederick Lindon Hatt senior retired from professional photography before the outbreak of the First World War. The Lindon Hatt studio is not listed in Kelly's 1915 Directory of Bristol. [ABOVE & BELOW] A Price List issued by Lindon Hatt & Sons of Chudleigh House, 10 Whiteladies Road, Clifton, Bristol, printed around 1908. Lindon Hatt & Son were producing photographs in the very modern format of the picture postcard ("3s 6d per dozen"), but they were still offering photographic portraits in the old traditional formats of "carte-de-visite" and "cabinet". 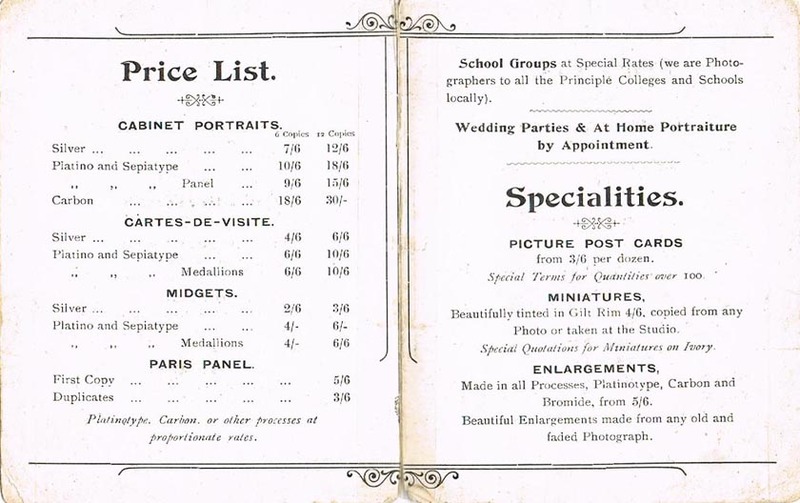 This pamphlet also mentions School Group photography ( "we are photographers to all the Principle Colleges and Schools locally"), Wedding Parties and "Home Portraiture by Appointment". Elsewhere in their prospectus, Lindon Hatt & Son offered to photograph machinery, architecture and landscapes. Frederick Lindon Hatt junior, the eldest child of Annie Marie Green and the photographer Frederick Lindon Hatt was born in Tunbrige Wells on 8th March 1876. Frederick junior later came to be known as "Lindon Hatt". Frederick Lindon Hatt junior (Lindon Hatt) eventually joined his father in the family photography business which was restyled as Lindon Hatt & Son. In 1908, Frederick Lindon Hatt junior married Edith Gertrude Holmes and moved to Hackney in London. During the 4th Quarter of 1909, Lindon Hatt's wife Edith gave birth to a baby boy, also named Frederick Lindon Hatt, but the child died in Hackney towards the end of 1909. Lindon and his wife moved to Islington, where a daughter named Valerie Hatt was born early in 1911. At the time of the 1911 census, Lindon Hatt was residing with his wife and three month old daughter at 23 St John's Park Mansions, Pemberton Gardens, Holloway, North London. On the census return, thirty-four year old Lindon Hatt is described as a "Manager for a Photographer". Frederick Lindon Hatt junior was fortunate to survive one of the great disasters of the First World War. During the Great War, Lindon Hatt was sent to work at the munitions complex at Chilwell, near Nottingham. On 1st July 1918, the Chilwell Munitions Factory exploded in one of Britain's worst wartime disasters. The factory blast injured around 250 and killed 134 workers, the biggest loss of life resulting from a single explosion during the First World War. After the war, Lindon Hatt found it difficult to establish himself as a self-employed professional photographer and he was obliged to find employment as a camera operator with Jerome Limited or one of the other chains of High Street photographic studios in London. Lindon Hatt later worked as a photographer for Bobby's Department Store. In the years leading to the Second World War, Lindon Hatt managed to establish his own photographic portrait studio, first at Tooting Broadway and then in Putney High Street. Frederick Lindon Hatt junior (aka Lindon Hatt) died on 2nd February 1944, aged 67. Robert Aspland Hatt ,the son of Robert and Elizabeth Hatt, was born in Brighton in 1876, when his father was a partner in the photographic firm of Lombardi & Co. At the time of the census, which was taken on 31st March 1901, Robert Aspland Hatt was recorded as a photographer, sharing his father's home at 55 Leswin Road, Stoke Newington, London. Robert Aspland Hatt died in Hackney in 1907 at the age of 31. Valerie Hatt the daughter of photographer Frederick Lindon Hatt junior (born 1876, Tunbridge Wells) had a long career in photography beginning in the 1930s. Barbara Bourn, the daughter of Nora Hatt, (Frederick Lindon Hatt junior's sister) also became a professional photographer. Valerie Lindon Hatt, the daughter of Edith Gertrude Holmes and Frederick Lindon Hatt junior, was born in Islington, London, in December 1910. Valerie Hatt worked as a professional photographer during the 1930s. For a period of time, Valerie Hatt was employed as a photographic worker at Bobby's Department Store, as had her father, F. Lindon Hatt. Valerie later went on to establish her own photographic business in Penge and Kingston. As a young woman Valerie Hatt was employed to retouch photographic negatives. Valerie Hatt worked as a "photo re-toucher" during the era of plate glass negatives. Re-touching negatives was painstaking work and needed a careful hand and eye. With the help of appropriate tools, Valerie could work on the original plate glass negative, subtly redefining the contours of a chin or the shape of a face, carefully eliminating the unsightly blemishes captured by the camera. Another of Valerie's tasks was to hand-colour the black and white or sepia photographs. As a skilful artist, Valerie was well suited to this challenging work. The colour was applied to the monochrome prints with a very small paintbrush, using a book of transparent watercolour stamps. 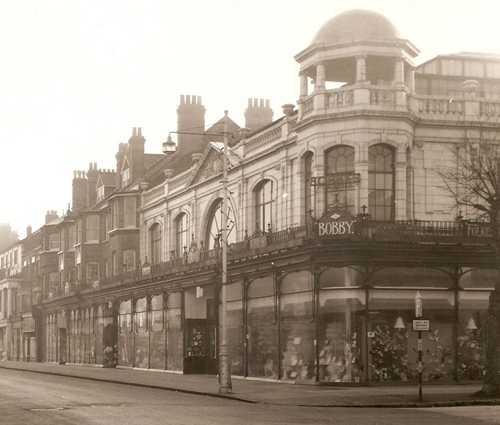 Valerie later worked as a photographer at Bobby's Department Store in Eastbourne and Margate. It was in Margate that she met her future husband. Once married, Valerie Hatt began her own photographic business. Valerie specialised in wedding photography. She would seek out weddings and arrive at the church with her camera and equipment. Taking photographs both before and after the church ceremony, Valerie would speedily develop and print the photographs, later selling the resulting photographic prints at the wedding reception. Eventually, Valerie Hatt opened her own studios in Penge and Kingston. Valerie Hatt operated two photographic studios in Penge: The Film Studios at 10 Croydon Road, Penge, and 201 High Street, Penge. During the Second World War, Valerie spent much of her time photographing servicemen and their families. During an air bombing raid, Valerie Hatt's studio at 201 High Street, Penge, took a direct hit, but Valerie Hatt and her husband survived the bomb blast by sheltering behind a door under the stairs. After the war, Valerie continued to work as a part-time photographer, having converted part of the cellar of her Hastings home into a dark room and studio. [ABOVE] Valerie Hatt ( 1910-1970), the daughter of Frederick Lindon Hatt junior. Valerie Hatt worked as a professional photographer in Eastbourne, Margate, Penge and Kingston during the 1930s and 1940s. Barbara Catherine Bourn was born in Hammersmith, London, in 1908, the daughter of Henry James Bourn and Nora Ethel Hatt. 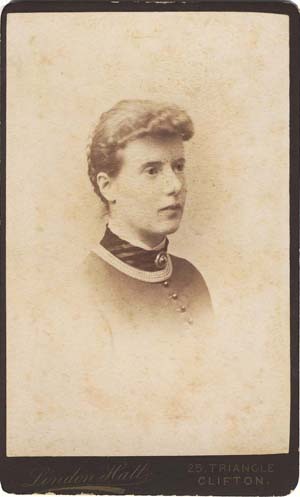 Barbara's mother, Nora Ethel Hatt was the daughter of the photographer Frederick Lindon Hatt senior (1844-1919). Barbara followed in the footsteps of her grandfather and became a professional photographer. As a young woman Barbara worked for the photographic firm of Thomas Fall Studios in Baker Street, London. 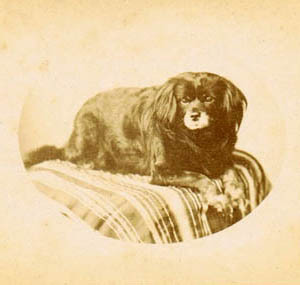 Thomas Fall, the founder of the firm, was one of the best known photographers of pedigree dogs. Thomas Fall started work as a photographer in the 1850s and set up his own studio in London around 1875. After Thomas Fall's death in 1900, the photographic business at 9 Baker Street, London passed into the hands of his children Sarah Maria Fall, John William Fall and George Frederick Fall, but the studio continued under the name of "Thomas Fall". 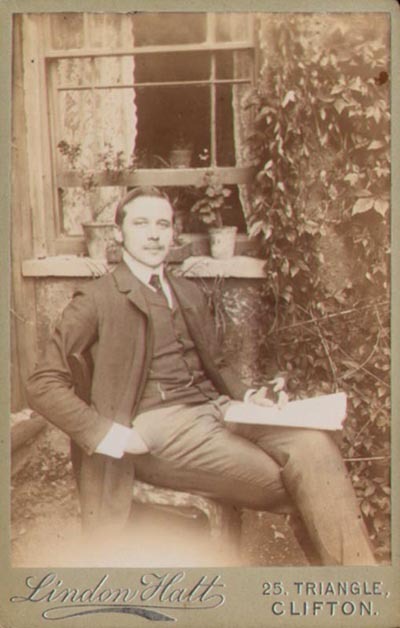 The chief photographer at the Thomas Fall Studio was Edward Hitchens Parker (born 1879, Cheltenham), who had previously managed Thomas Fall's branch studio in Hampstead. Edward Hitchens Parker purchased the Thomas Fall Studio at 9 Baker Street, London, in 1910. Barbara Bourn joined the Thomas Fall Studio in 1927 and worked as a photographer's assistant to Edward Hitchens Parker. In 1936, Barbara Bourn became a partner in the Thomas Fall Studio. 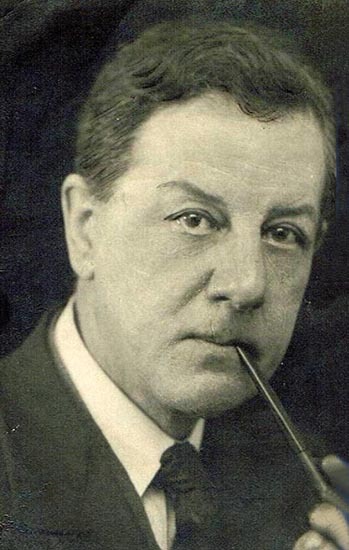 When Edward Hitchens Parker died in 1958, the firm of Thomas Fall Studios passed to his business partner and chief photographer Barbara Bourn. Inheriting the long established firm of Thomas Fall Studios, Barbara Bourn became the guardian of the hundreds of original glass negatives collected since the business was first established in 1876. Amongst this unique archive were negatives of the then Princess Alexandra's pets and photographs of King George V's clumber spaniels. The Thomas Fall Photo Library, as it became known, contained pictorial records of dog show winners from almost every breed of dog. The firm of Thomas Fall had been commissioned to photograph the prize-winning dogs displayed at the famous dog shows organised by Charles Alfred Cruft (1852-1938). Apparently, Thomas Fall's camera was present when Charles Cruft organised his first dog show in 1886 and when "Cruft's Greatest Dog Show" was mounted in London in 1891. The Thomas Fall Photo Library therefore has great historical value. 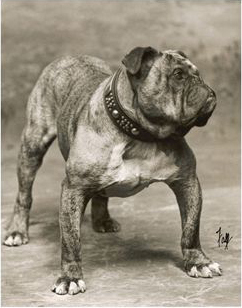 In a very graphic way, the photographs in the archive demonstrate how breeds of dog have changed over the last 130 years. In the early 1960s, Barbara Bourn left London's Baker Street and re-located to premises in Stanmore, Middlesex. In 1968, Barbara Bourn moved the Thomas Fall Studio to Wembley. In 1972, Barbara Bourn married fellow photographer William Burrows. By 1876, the couple had moved the Thomas Fall business to Frome, Somerset. From their new base in the West Country, Barbara and William Burrows travelled from dog show to dog show in a specially adapted caravan which served as a portable studio. 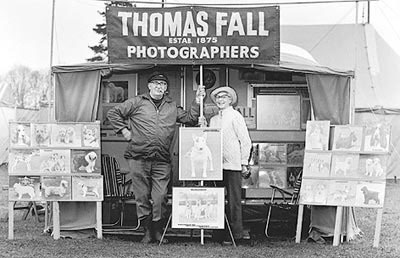 When Mrs Barbara Burrows and her husband retired from canine photography in 1990, they continued to manage the Thomas Fall Archive, supplying pictures for books and magazines. After William Burrows died in 2002, the Thomas Fall Archive was acquired by the Mary Evans Picture Library. 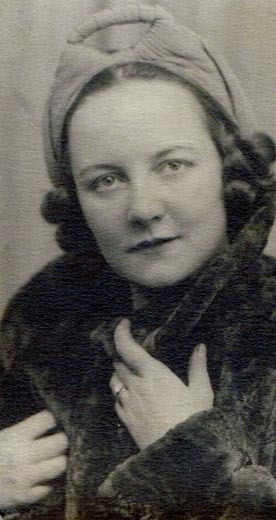 Mrs Barbara Burrows (Barbara Bourn) died in Bath on 16th March 2005 at the age of 96. In an obituary published in the "Our Dogs" online newspaper, Paul Keevil described Barbara Bourn's dog photographs as "impeccable and technically flawless" and classed her as "truly one of the giants of canine photography". [ABOVE] A photographic portrait of "Constones Cadet" by the Thomas Fall Studio. After Barbara Bourn retired from canine photography the Thomas Fall Archive of historical dog photographs was preserved intact when it was purchased by the Mary Evans Picture Library. [ABOVE] A carte-de-visite portrait of Colonel Frederick G. Burnaby (1842-1885) of the Royal Horse Guards, photographed at Thomas Fall's Baker Street studio around 1884. Thomas Fall was born on 19th October 1833 in Leyburn, Yorkshire. 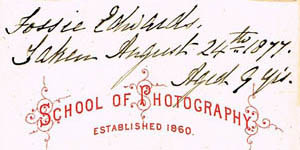 In 1867, Thomas Fall moved down to London to work as a photographer in the famous portrait studio of Elliott & Fry. 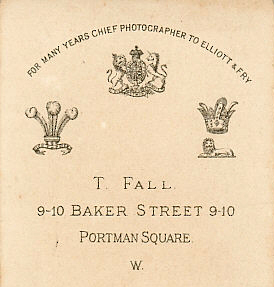 By 1875, Thomas Fall had established his own photographic studio at 9 Baker Street, London. 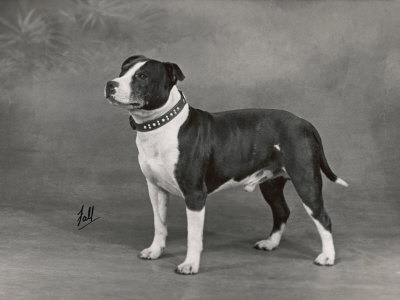 Thomas Fall specialised in canine photography and in the 1890s became well-known for his photographs of champion dogs. 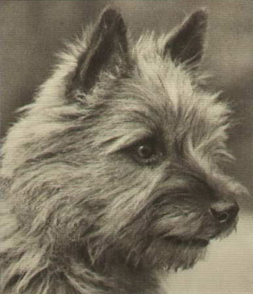 [ABOVE] Portrait of a cairn terrier, photographed around 1931 when Barbara Bourn was the chief photographer at the Thomas Fall Studio. 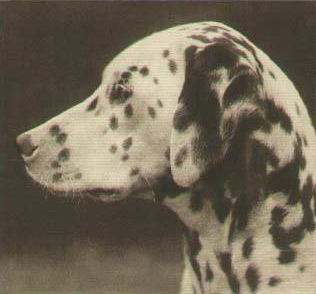 [ABOVE] Portrait of a dalmation, photographed around 1934 when Barbara Bourn was the chief photographer at the Thomas Fall Studio. 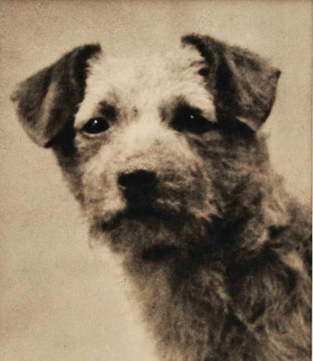 [ABOVE] Portrait of a border terrier photographed around 1934 when Barbara Bourn was the chief photographer at the Thomas Fall Studio. 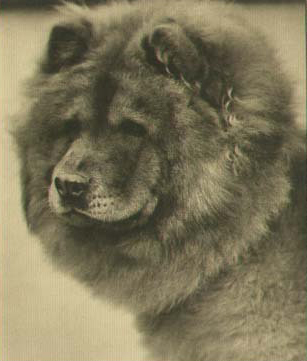 [ABOVE] Portrait of a chow-chow, photographed around 1931 when Barbara Bourn was the chief photographer at the Thomas Fall Studio. [ABOVE] A photographic portrait of "Champion Pressgang" by the Thomas Fall Studio. 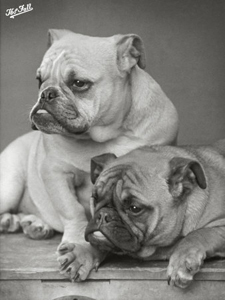 [ABOVE] A photographic portrait of two bulldogs by the Thomas Fall Studio. Thanks to Nicolette Gunn and Jennifer Perraton, descendants of Frederick Lindon Hatt, who have helped to research and author this study of the Hatt Family of Photographers. Thanks to Mr & Mrs Leeds for supplying the carte-de-visite from Robert Hatt's Balls Pond Road studio. 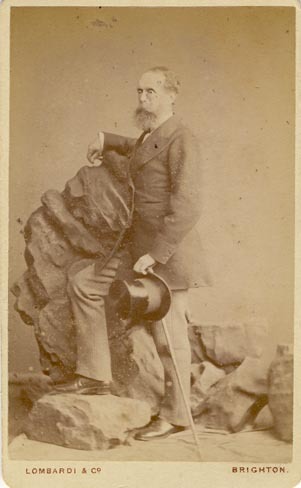 Thanks to Sarah Mitchell for the information on the London photographer James Syrus Tulley (c1827-1891) who worked under the professional name of "Napoleon Syrus". I am grateful to Paul Keevil for additional information on Barbara Bourn's life and career provided in the Barbara Burrows' obituary published on the Our Dogs website (www.ourdogs.co.uk). Thanks also to Mr & Mrs Leeds (for providing photographs by Robert Hatt of Balls Pond Road). 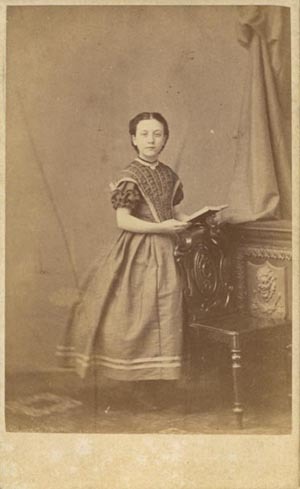 The photographs of Alice Adeline Pavey taken at the portrait studios of Robert Hatt and Aspland Whiting have been kindly provided by Philippa Cawthorne, a descendant of Eliza Hatt (born 1832, London), a sister of the photographers William Hatt, Robert Hatt, Emma Jane Hatt and Frederick Lindon Hatt. PRIMARY SOURCES : Census returns : 1841, 1851, 1861, 1871, 1881, 1891, 1901, 1911; Brighton and Sussex Trade Directories :1864 (Folthorp / Page,), 1865 (Simpson/ Page), 1866, 1867 (Kelly/ Harrod/Postal & Commercial/Page), 1868, 1869 (Page) ,1870 (Post Office), 1870 (Mathieson),1870, 1871, 1872, 1873 (Page) 1874 (Kelly), 1876 (Page/ Steven & Co.) 1877 (Page), 1878 (Kelly), 1879, 1880 (Page),1882 (Kelly), 1882, 1883, 1884 (Page). Websites : Births, Marriages & Deaths Records on FreeBMD ; 1881 Census & International Genealogical Index on LDS Family Search. Census returns were also explored on the UK Census Collection featured on the ancestry.co.uk website, 1901 Census Online and the 1911 Census website. Photographic areer and biographical details of Emma Jane Hatt, Frederick Hatt, Robert Hatt, Robert Aspland Hatt and William Hatt on The Database of 19th Century Photographers and Allied Trades in London: 1841-1901 (based on the research of David Webb) which is featured on the photoLondon website. Reports of William Hatt's divorce proceedings and bankruptcies were found on the online newspaper archive The London Gazette (http://www.london-gazette.co.uk) and The Times Archive on Timesonline (http://archive.timesonline.co.uk).